Formed by drummer Tom Major in 1993, Entrain is also lead singer/guitar wiz Brian Alex. Joining them is bassist M’Talewa, saxophonist/keys/percussionist Rob Loyot, saxophonist/percussionist Hilary Noble and Trombone/keys Lennie Peterson Veterans all, their collective resume includes stints with such diverse players as Bo Diddley, Carly Simon, Chuck Berry, Southside Johnny, James Mongomery, Flor De Cana, and Blood, Sweat, and Tears. 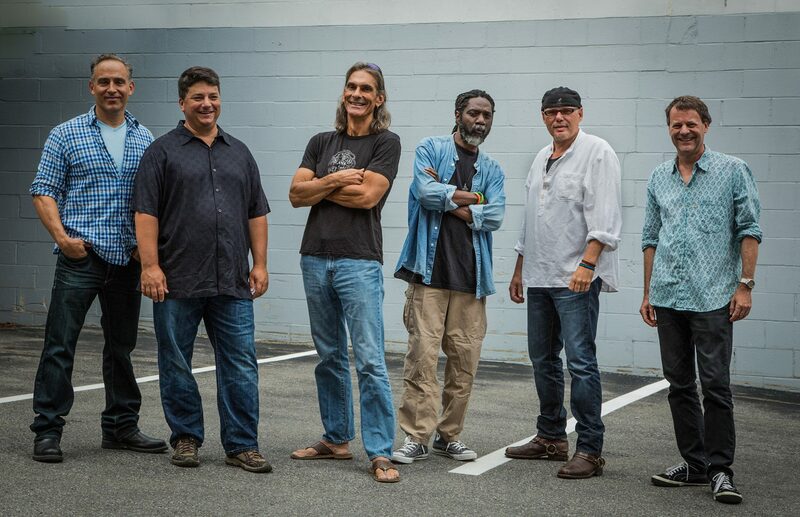 Entrain has recorded eight albums, available on Dolphin Safe Records, all of which have been praised for their ability to shift effortlessly between musical styles – from rock, blues, calypso and ska, to zydeco, jazz and funk – often within the same song. “The whole Entrain concept is based around the drums and infectious rhythms. Once we’ve got that…. anything goes, everything goes,” explains Major.